When users attempt to change the Calendar's Default reminder from 15 minutes to a value of 1 day or more, the new value isn't saved. Enter the minutes you want to use for the reminder ie, 1440 Decimal equals 1 day. Note: If the key does not already exist, you need to create it! You can copy and paste the following text into notepad (edit the value, if desired) and save it using the .reg extension, then double click to run it. 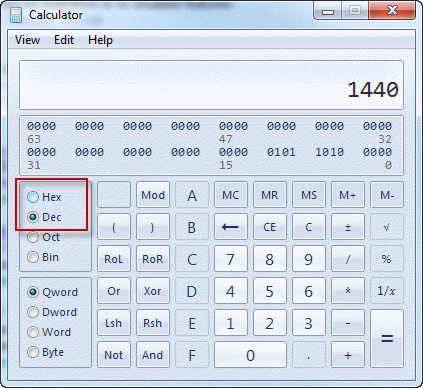 To convert Decimal value numbers (minutes) to Hex, open Window's Calculator. On it's view menu, choose Programming. Select Dec and enter the desired time in minutes, then select Hex. Replace the "5a0" value in the RemindDefault value with the resulting Hex code. Add or remove the leading 0's to keep the value 8 digits long. If you don't want to muck around the registry or create your own *.reg file, you can run this *.reg file to set the registry key for a 1 day reminder. It's set for 1440 minutes (24 hours/1 day), if you want to change the time, open it using Notepad to edit it using the instructions above to get the correct value to use.